I got this idea from my friend, Maizy. She is the cutest QT I've ever met and her passion for life and love is inspiring. Check out her IG here for photos of delish vegan food, flowers and trees, feminist messages and gorgeous selfies. 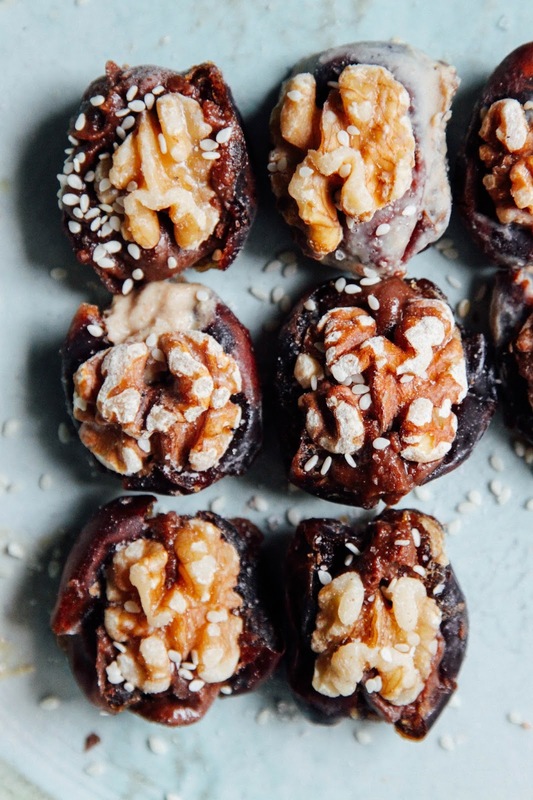 This recipe is SUPER basic, ya just throw nut butter into dates and stick 'em in the freezer for a few minutes. But the result is fabulous. They are gooey, cold, creamy, salty (if you sprinkle on a lil salt... do it), sweet and decadent. They're also made of foods that are good for you. These fudge bites are duel-functioning: they are a rich treat/dessert but also an energy snack. Eat as many as you want, whenever you want. 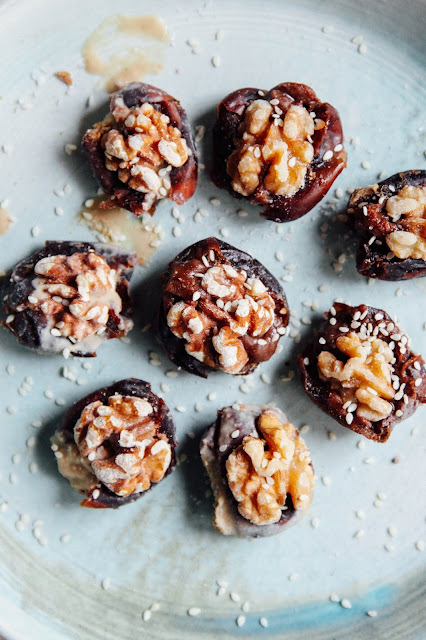 Scoop a little nut butter into the dates, top with a walnut half, sprinkle on the teensiest amount of salt and put in the freezer for 10 minutes. Voila. NOTES: you can use any variety of dates, medjools work well because they are giant, but lately I've been preferring Bam dates (aka Mazafati dates, according to wikipedia). 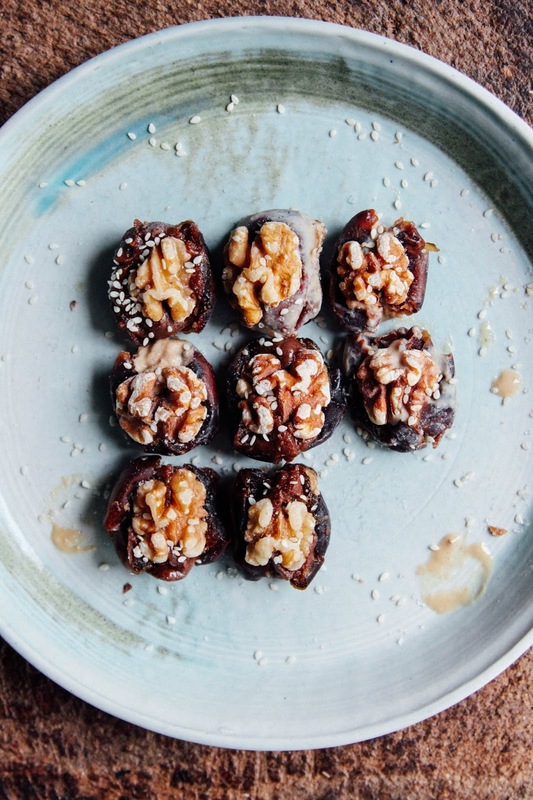 You can use any nut or seed butter you like. You can add whatever toppings you want, I threw on some sesame seeds for aesthetic reasons here. And use any nut to top the bites with! I just had walnuts nearby me so I used walnuts. THIS! Perfect reward for finishing my assignment 6 minutes before the deadline (noregrets). Also, your heartfelt posts about your personal troubles on IG moved me so much I had inspiration for my last canvas. I am gonna paint a woman who's heart is replaced wit a butterfly, as it represents both fragility, the changing nature of feelings, and hidden strength (because the wings of a butterfly actually have scales on them, something nobody would know unless they looked closely enough). I shall snap a pic of it on IG (marvelous.max) when I start! Love and light. new to your blog and newly back on the vegetarian wagon, and these are amazing!! thanks for all of your posts and this one in particular!